Renderings at left depict the end result of Iowa City’s Gateway Project, which will elevate North Dubuque Street 10 feet, raising it 1 foot above the 100-year flood level. The project also includes construction of a new Park Road bridge that will stand higher than the 200-year flood level. Current photographs of the area are to the right of the renderings. The upper views are from Mayflower Hall looking southwest; the lower views look south from the Beckwith Boathouse toward Dubuque Street and the Park Road bridge. Renderings courtesy of the City of Iowa City; photos by Helaina Thompson. Drivers beware: Significant road construction is coming to North Dubuque Street and West Park Road as early as next week. Expect 15- to 30-minute delays during peak hours, as well as occasional closures, starting May 31. Iowa City’s Gateway Project will elevate North Dubuque Street 10 feet, raising it 1 foot above the 100-year flood level. The project also includes construction of a new Park Road bridge that will stand higher than the 200-year flood level. During construction, MidAmerican Energy Co. will take overhead utility lines and install them underground, and existing piping, sewage draining, and water lines will be moved. In the long term, this project will reduce the annual chance of a flood closing North Dubuque Street to 1 percent. In the short term, the project will cause delays and occasional detours. Construction on North Dubuque Street will extend from Foster Road to the alley between East Brown Street and East Ronalds Street. Drivers should expect one lane in either direction to remain open, except for occasional closures, until the project’s 2018 scheduled completion date. 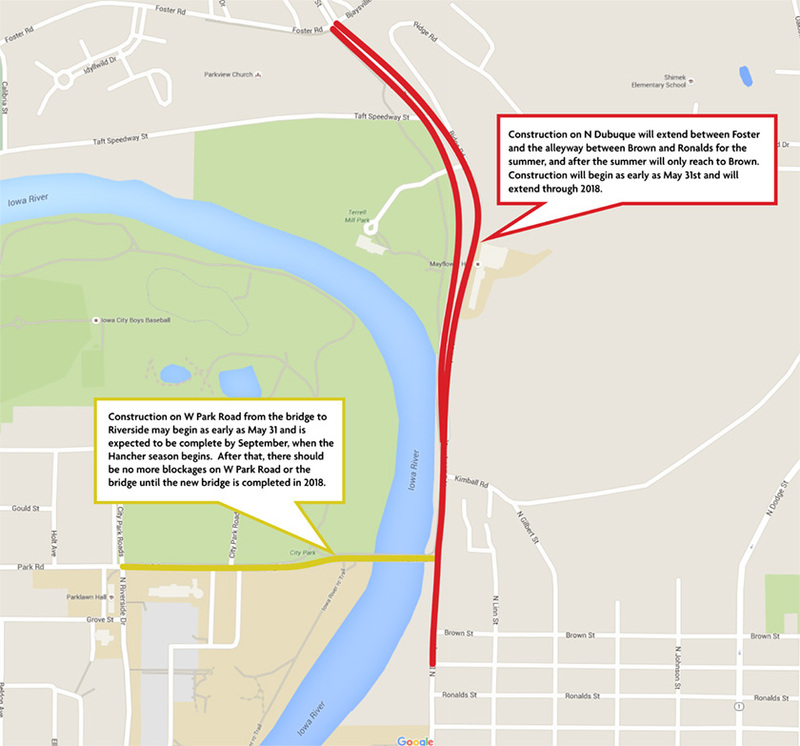 Construction to widen West Park Road will occur between the Park Road bridge and North Riverside Drive. One lane in either direction will remain open, and construction is scheduled to finish by September 2016. Construction of the new bridge should not affect traffic until it is completed and joined to North Dubuque Street and West Park Road in 2018. “Critical closures” lasting up to 10 days occasionally will be necessary. Iowa City officials state that, as often as possible, these closures will occur during university breaks. Depending on weather and construction progress, officials estimate they will be able to give one week’s notice of closures on the city of Iowa City’s website (https://www.icgov.org/). The city also will tweet about closures and will post alerts to its Facebook page. The University of Iowa is advising students, faculty, and staff traveling between downtown Iowa City and Interstate 80 to expect 15- to 30-minute delays during peak hours: 6 a.m. to 9 a.m. and 4 p.m. to 7 p.m. Drivers are advised to pay attention to traffic reports and plan alternate routes when connecting to I-80, such as Dodge Street and Highway 1 or First Avenue and Highway 6. When planning alternate routes, the UI reminds drivers of the construction on Hawkins Drive between Highway 6 and Finkbine Drive, which has narrowed the road to one lane in either direction. Construction on Hawkins Drive is expected to finish Aug. 12. Every day, about 25,000 cars travel the stretch of North Dubuque Street scheduled for construction. North Dubuque Street experienced lengthy closures due to flooding in 1993, 2008, 2013, and 2014. Sidewalk and road construction on and near the University of Iowa campus can be viewed on this regularly updated map: https://maps.facilities.uiowa.edu/flexviewer/closures/.